What's it like to be a new dog handler? 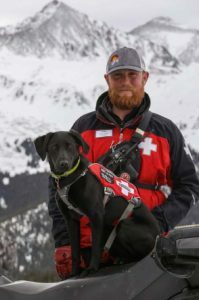 C-RAD has some new faces this year, including new avalanche dog Tikka and her handler, Erich! Tikka is eight months old and just started work at Arapahoe Basin Ski Area. We chatted with Erich about his first months as a dog handler. 1.Why did you want to be an avalanche dog handler? I’ve always had a connection with dogs and it was never really a plan, but when I started ski patrolling, I saw an opportunity. It seemed like it would be an awesome thing to do to bring my two passions together. 2. How did you choose Tikka? We talked to multiple breeders that we had past experience with, either through A-Basin or C-RAD and settled on one that had a litter with timing that worked for us. We visited the puppies at about six weeks old and evaluated them. We examined their curiosity, temperament, drive and a few other behaviors. Ultimately, We felt Tikka had the best chance for success in our program. 3. So far, what’s the most rewarding part of the job? Watching Tikka grow from 9 weeks old to now and seeing how much she’s progressed and what she’s done; having the opportunity to mold and shape a puppy into a well-behaved dog and getting into the rescue training. 4. What about the most challenging part of the job? Trying not to make mistakes that will have lasting effects on Tikka's training. That, and feeling like I never have enough time to train with her as much as I'd like. But, I just keep reinforcing positive things and going with my instincts, and it usually works out. 5. Tikka just started work at A-Basin. Tell me about her first few days. Her first few days have been filled with brand new experiences. Snowmaking guns, snowmobiles, snow cats, being around skis and skiing, and being in a new place up at Patrol Headquarters. She’s been adapting and getting used to her new workplace and everything that comes with it. 6. What’s your favorite part about working with C-RAD? The camaraderie with the other handlers and the openness and willingness to help each other succeed. Also, having the opportunity to potentially save a life one day.